Colorectal cancer is the third most diagnosed and second leading cause of cancer-related deaths in both men and women in the United States [1, 2]. Most cancers, including colon cancer (CoCa), progress by up-regulating cell growth and survival signaling while evading cell death [3–8]. As a result, treatment modalities that not only reduce CoCa cell growth but also more importantly re-establish a proper balance in cell death and survival could be better treatment options. Current treatment options  fail to achieve optimal clinical response due to development of resistance and toxicity. Hence, less toxic and efficacious therapy is needed to treat CoCa. Extensive research to assess the potential of nutrients and herbal extracts as a single agent or as an additive to conventional therapeutics has been conducted in cancer prevention and treatment [10–13]. Biochemical and molecular investigations have demonstrated that several classes of compounds present in vegetables and fruits possess beneficial properties to fight against infection, inflammation, and oxidation . Anthraquinones are a class of natural compounds that exhibit many of these beneficial properties and induce cancer cell death [14–17]. Emodin, an anthraquinone derived from more than 17 plant families worldwide, has been used for centuries as herbal laxative, anti-inflammatory or anti-microbial agent [17–20]. Studies have shown that Emodin promotes apoptosis, inhibits DNA synthesis, and promotes free radical generation in breast, lung, and prostate cancers. Further, this agent has the ability to inhibit metastasis and increase the efficacy of other anti-cancer agents with minimal toxicity to normal cells [20–28]. Many of these anti-cancerous properties have been explored in CoCa, but the mechanistic studies defining the molecular pathways impacted by Emodin have not been fully defined. In this study, the molecular changes associated with Emodin-induced apoptosis, Bcl-2 family gene expression, and survival signaling in CoCa cells were evaluated. Our findings highlight the potential of Emodin as a potent anti-cancer agent in the treatment of advanced CoCa. Colon cancer (CoCa) is a leading cause of cancer-related deaths worldwide [29, 30]. Though ~ 95% of CoCa cases are considered to be sporadic, early detection via routine health screenings has been effective in reducing CoCa risk by up to 90% in patients 50 years or older [1–3]. Unfortunately, a great number of patients succumb to advanced stage disease before adequate treatment can be received [21, 22]. Treatment for advanced stage CoCa primarily consists of corrective surgery in combination with chemotherapy. Adverse side effects such as chemo-resistance and micro-metastasis have been associated with these treatment options that show only a 14% 5-year survival rate [4–7]. Due to these complications, there continues to be a need to explore new avenues to treat CoCa more effectively with minimal toxicity to patients. Emodin, a naturally occurring anthraquinone, has a wide range of pharmacological properties that make it an attractive candidate for cancer therapeutics such as its ability to induce apoptosis, cell cycle arrest, and inhibit DNA synthesis [20–28]. In cancers affecting the digestive tract, Emodin decreased metastasis, reduced survival signaling, and enhanced antitumor effects of other chemotherapeutic agents [5, 31–36]. Our data shows Emodin reduced the proliferation of CoCa cells in a concentration and time-dependent manner. This inhibition was achieved at relatively low concentrations (~ 20 μM) while toxicity to normal colon epithelium was relatively low. Reduced viability was mainly due to Emodin-induced apoptosis of CoCa cells. Though inhibition of proliferation has been documented, there is a lack of information regarding the molecular changes associated with Emodin induced apoptosis in CoCa. We provide a deeper molecular perspective on how Emodin induces apoptotic cell death in CoCa. Our data shows Emodin treatment induces apoptosis in CoCa by differentially modulating the expression of extrinsic and intrinsic apoptotic molecules, cell survival signaling, and the localization or activity of Bcl-2 family of proteins. Bcl-2 family proteins are key regulators of intrinsic apoptosis as their expression, localization, and binding has been associated with mitochondrial dysfunction, leakage of cytochrome c, and downstream apoptotic activation [22, 32, 37–39]. Emodin’s ability to modulate both anti- and pro-apoptotic Bcl-2 family proteins during apoptosis has been observed in several cancer models. However, information on regulation of the expression, localization, and function of these proteins in CoCa apoptosis induced by Emodin is limited. We observed a direct modulation of Bcl-2 family proteins level and localization during Emodin-induced apoptosis. Total cell expression of pro-apoptotic Bcl-2 family proteins Bak and Bax were differentially increased in CoCa models compared to Bcl-2 levels. 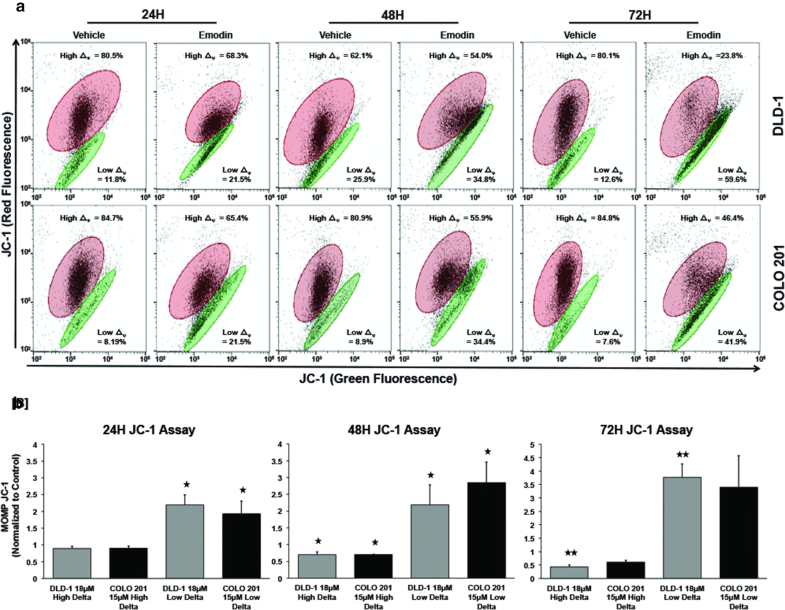 Analysis of cytosolic and mitochondrial fractions of CoCa cells revealed an increase in the levels of Bax in COLO 201 cells in contrast to anti-apoptotic Bcl-2 protein levels. 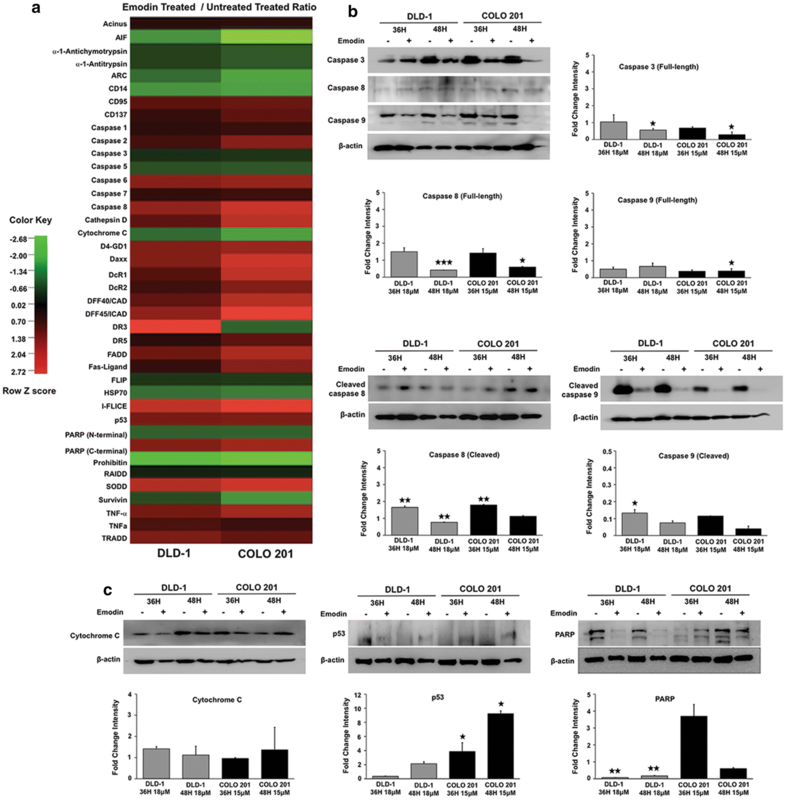 Previous studies have indicated that increase in pro-apoptotic proteins Bax and Bak with decreased levels of anti-apoptotic proteins like Bcl-2 in both total and mitochondrial fractions are a major driving force in mitochondrial dysfunction and subsequent apoptosis in some anti-cancer treatments [16, 25, 29, 31–33]. Our data further supports these observations as Emodin regulated Bcl-2 family protein levels and localization that could lead to the observed loss of MOMP, increased cytosolic cytochrome c levels, and apoptosis. Cancer cells steer cell machinery to gain self-sufficiency in proliferation while evading death signaling. Dysregulated growth and survival signaling can modify the expression and potency of apoptotic molecules during apoptosis. 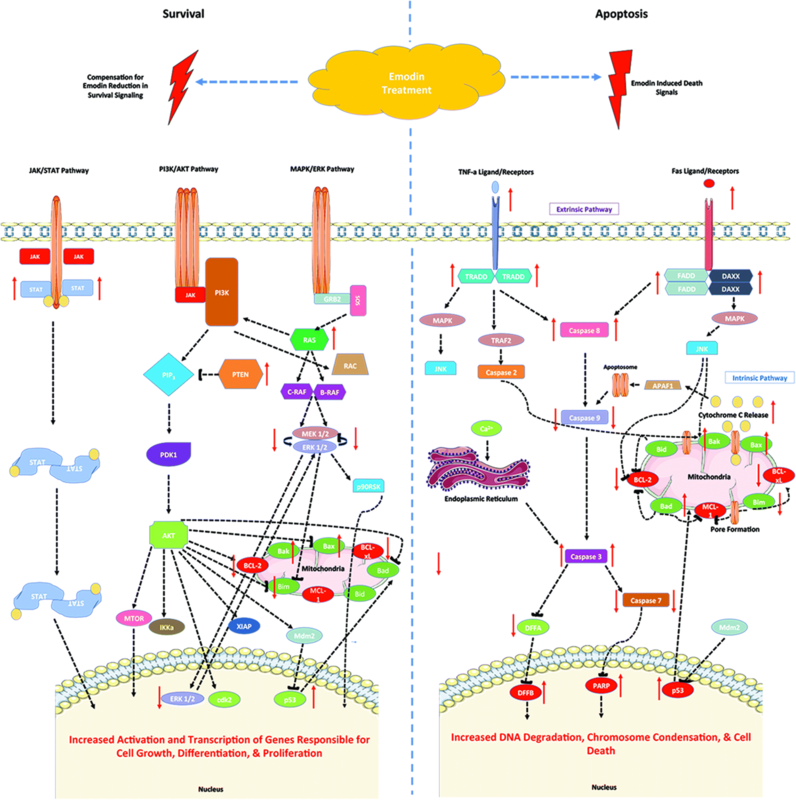 Previous studies have shown Emodin that modulated growth and survival signaling pathways associated with cancer proliferation and evasion of apoptosis [26, 28, 38, 41–44]. Our data shows Emodin reduces several regulatory components involved in MAPK/JNK, PI3K/AKT, NF-κβ, and STAT pathways associated with apoptotic functions of Bcl-2 family proteins. MAPK/JNK pathway has been shown to regulate the activity and levels of Bcl-2 family proteins post-translationally by phosphorylating serine residues on apoptotic proteins like Bim. Phosphorylation by MAPK (ERK1/2) can induce Bim ubiquitination and reduced binding to anti-apoptotic Bcl-2 or enhance its stability [16, 39]. MAPK (ERK1/2) and phosphorylated MAPK protein were reduced after Emodin treatment of CoCa cells, which correlated to reduced Bim expression. C-Jun (JNK) also phosphorylates Bim inducing its cleavage from dynein complexes and binding to other Bcl-2 family proteins. Reduced expression of these MAPK/JNK signaling components may reduce Bcl-2 family pro-apoptotic functions. It could lead to the reduction in expression of these proteins as observed after Emodin treatment as summarized in Fig. 6. Similar correlations to Bcl-2 family proteins level were observed in the PI3K/AKT pathway during Emodin-induced apoptosis. It reduced phosphorylation of catalytic complex 110b of PI3K and pPTEN S380. 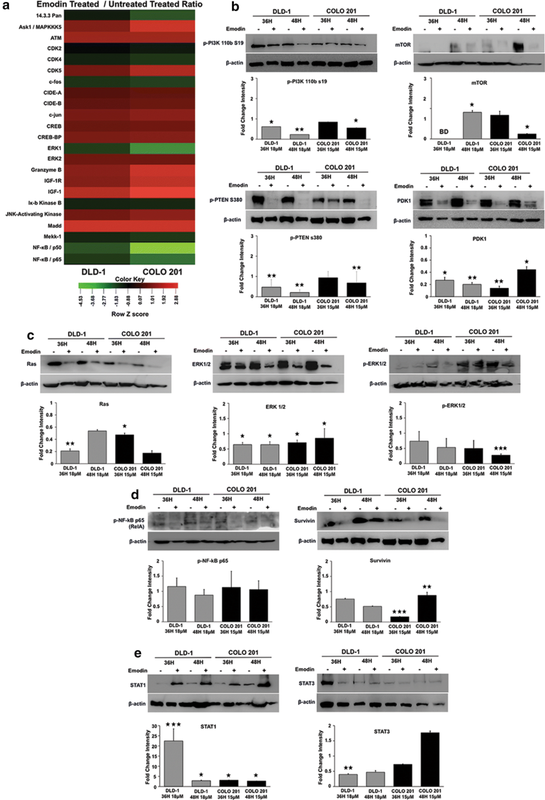 Reduced 110b expression can limit PI3K activation and downstream activation of mTOR and PDK1. Aberrant mTOR signaling promotes AKT activation leading to increased proliferation and inhibition of cell death in many cancers. Studies indicate Emodin decreases the expression and function of mTOR [33, 45–49], and we observed similar results as mTOR expression was significantly decreased in CoCa cells. PDK1 inhibition impairs cell growth and increases cell death under hypoxia in cancer. Its expression decreased in CoCa following Emodin treatment, correlating with reduced PI3K/AKT signaling during CoCa apoptosis. 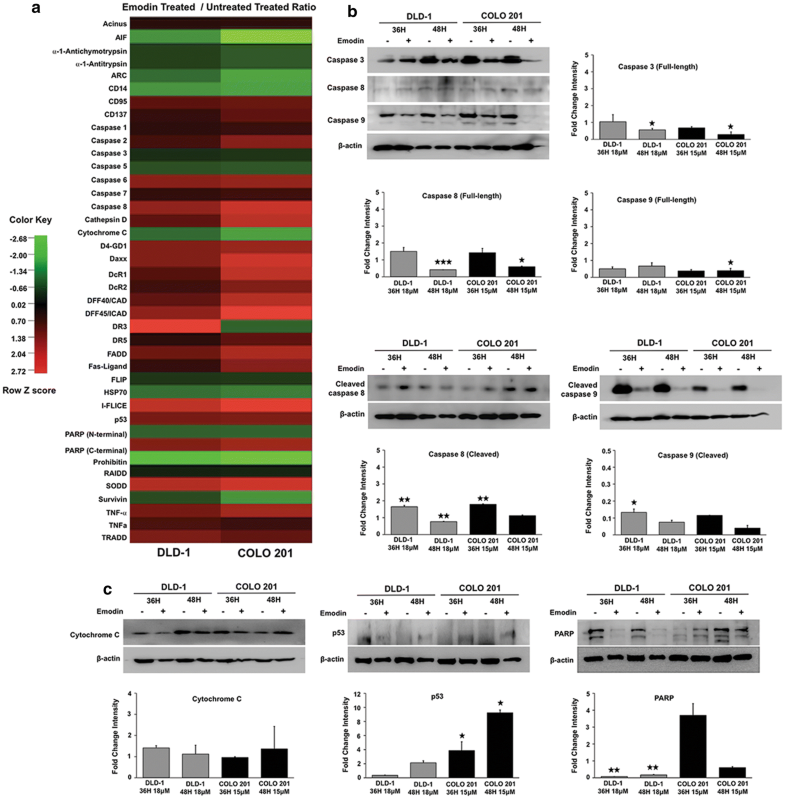 PI3K/AKT signaling also inhibits the activity and translocation of pro-apoptotic Bax to the mitochondrial membrane and represses downstream transcription of Bim via FOXO3a [26, 39–43]. Our data suggests, as shown in Fig. 6, Emodin induces cell death in CoCa cells by reducing PI3K/AKT signaling that otherwise protects cancer from death.